Of course when I decided to go to South America for half a year it was clear to me that I would bring my camera as well. Photography will be an important part of this journey and I will post pictures when I have web connection. Of course I take a lot of pictures during this time and I won’t post all of them on Instagram and Facebook. However, you will find more pictures from my travels if you click the following button, or if you klick on one of the images at the beginning of every post. I will update the images in this link from time to time, when I also post something new here. So the first few weeks of this trip we spent together as a family traveling from Buenos Aires in Argentina to the very southern most tip of Patagonia and back up to Santiago de Chile. And we saw a lot. Some of the highlights include of course Buenos Aires itself, El Chaltén with the peaks of Fitzroy and Cerro Torre, Perito Moreno Glacier and, the cruise from Ushuaia to Punta Arenas on the Stella Australis. I will post some stories, more detailed descriptions and more images in the coming days. Buenos Aires 13.12. - 15.12. Well, what did we learn in Baires? Clearly, that there's rain in South America, too. The day we arrived, it rained like crazy, absolutely bonkers. The streets were flooded and I remember this one time where we had a very good laught, at the expense of a lady that had just been completely drenched by a literal wave, originating from a bypassing bus. I have been splashed by bypassing cars and it's very unpleasant. But that was nothing in comparison. The woman was as wet as if someone had pushed her into a pool! The first impression of South America for me was that it's a lot louder than Europe. Everything seems to be at another level of volume. Definitely something that will take me some time to adapt to. Then, we were also introduced to Mate, by our great city guide. It's a hot beverage that many Argentinians drink day in, day out. I'd describe the effect of a one sip as the combination of drinking a can of coke and 3 very strong black teas at the same time. It's absolutely incredible, and a good explanation why Argentinian nightlife starts around 2 a.m. Well, I like it. El Calafate 15.12. - 17.12. In El Calafate we went to the world famous Perito Moreno Glacier, which many will know from photographs of Patagonia. The glacier forms up in the mountains and flows down into an immense lake. Sometimes, it grows so large that it cuts the lake into two, seperating it into two bodies of water. This separation is actually so tight that on both sides of the glacier tung, the water levels develop in different ways. From what I record there can be over 10 meters difference in water levels, which is absolutely massive, if you think about the amount of water required for that. After a while however, the forces on the icy dam become so strong that it eventually breaks and gives way to water flow. When we were there, there were no differing water levels, but one could still see the tunnel in the ice, connecting the two parts of the lake. We took a boat trip to get nearer to the glacier, which was absolutely stunning. While we were there, some smaller blocks of ice fell off the glacier face and dropped into the water, creating big slashes. El Chaltén 17.12. - 20.12. From El Calafate we went to El Chaltén, which is about 3 hours north of El Calafate by bus. El Chaltén is the home of some of the best known peaks of Patagonia, Mt. Fitzroy / Chaltén and Cerro Torre (the latter a bit lesser known to many, but in my eyes the prettier one). It's a paradise for hikers and mountain climbers. And guess what we did - hike. The days were very long with sun rising at about 5:30 a.m. and setting around 10 p.m. I managed to photograph sunset and sunrise once each, which resulted in a very, very short night of about 2 or 3 hours. Because after sunset I didn't directly go to bed and in the morning me and my dad hiked for about one hour before reaching the place we wanted to photograph from. Of course, we were the only ones. But as Patagonia has become very popular, especially with photographers, I doubt that this would be the case in high high season (we were there at the beginning of high season). Sunrise was absolutely stunning, we had some of the best conditions I've ever experienced and I think we both walked towards breakfast with a few very good pictures. What I realized once again, standing in front of all these wonderful mountains, is that many mountains back home are not nearly as famous as these, but are just as beautiful. Of course, Cerro Torre has a stunning form and for climbers it surely is something different. But from a purely aesthetic standpoint, the Swiss Alps have a lot to offer that is at the same level. Don't get me wrong, I don't want to say that it's not worth seeing them. But I don't think it's worth it flying around the globe for only this if you have some pretty mountains at home as well. That being said, something that is different are the animals. There are just so many more in Patagonia than in Switzerland. And that is what really enchanted me. Mainly the birds. The ones that excited me most were the colorful Caranachos (hawks) and the huge Condors of course. Ushuaia is the most southern city in the world (at least that's what they say - I didn't check, but if you look at the map, it sounds pretty plausible). And with around 100'000 inhabitants it's not that small for such a secluded place, either. From here, cruise and research ships leave to visit Antarctica. We came to Ushuaia to board a ship as well, but not one to the white continent. When we got there, it had just begun to rain. We were picked up by our transfer to the hotel and not much after arriving at the hotel, we already left again, to go on a hike in the area. We went to Laguna Esmeralda, a lake fed by glaciers and therefore of a wonderful blue color. As part of a bigger group of about 8 people (if I recall correctly) we hiked through beautiful woodland, until we reached a more open area, where trees were more sparse and smaller. When we arrived at the lake it was around 5 p.m., but due to our very southerly location, we still had a few more hours before it would get dark. So me and my brother decided to walk around the lake, which, in the end, took a bit longer than expected, but definitely was worth it. At first the trail was marked quite well, but at the far end of the lake, it vanished for a while and we were struggling for some time to decide in which exact direction we should go. That we came across a family of Upland Geese (see images) didn't help of course, because I had to take pictures of them (and I think I got some pretty nice ones out of that). What we also saw was the shortsighted nature of (some) humans. Patagonia has long been struggling with economic growth and I guess only in more recent years, tourism has picked up a lot. But before that, this area in the far south didn't have a lot going for it (economically speaking). And so one of the ideas of the government was to introduce beavers, in order to sell their fur (around 1946). It wasn't quite clear, whether it was the plan to release them into nature or keep them contained, but it doesn't really matter. The Canadian beavers that were introduced thrived, because they didn't really have any predators and the people didn't hunt them because the winters are more mild than where they come from and so they didn't grow as thick and fluffy furs. (They do, however, grow very big, a lot bigger than their Canadian brothers and sisters.) So in the end, this plan of pushing the local economy all but succeeded and left the area with a growing population of beavers (estimates range from 100'000 - 200'000) And this might not be clear immediately, but they can have a rather destructive effect on their surrounding. Not only do they chew on trees, but with their (impressively tight and stable - you can totally walk on the bigger ones) dams, they flood large areas. And while that might not initially be an issue, the trees here are by no means adapted to beavers in their ecosystem. So they don't do well in constant submerged territory and die. If you look at the images of that day (21.12. ), you'll see one that depicts this very well. One report states that the beavers are like "bulldozers thrashing through the area". The Chilean and Argentinian governments have agreed on a plan to eradicate the beaver completely, which, apparently is the biggest attempt of eradication ever made. After a nice dinner in a simple and cosy forest hut, we drove back to town. The next day we went on a trip to Tierra del Fuego National Park. In Patagonia, you often see trees that seem to bear weird, orange-yellow balls, that could easily be mistaken for fruit from afar. However, these are parasitic fungi, that live off of the tree's sap and make these colorful, squishy balls to disperse further. In some areas, there doesn't seem to be a single tree that isn't in a battle with a fungus. Then there are other areas, where you hardly see any. If you look at the images of the 22.12., you'll get an idea of what I'm talking about. The little thingys that hang off the trees are called indian's bread, because the native people used to eat it. Nowadays there are a few people that still use it in dishes, but for most it's way too tasteless to consider eating. I found it quite interesting to bite on. It doesn't taste like much, but it has a certain flavour and sweetness to it. On our third and last day in Ushuaia (23.12. ), we did a short boat trip to nearby sealion and bird colonies. That was very interesting as well, and of course I shot tons of photos of nesting Magellanic Cormorants (Phalacrocorax magellanicus) with their babies and of sealions lazing around. After that, we boarded the ship that would take us on a cruise all the way to Punta Arenas in Chile. But more of that next time. On the 23rd, a very special part of our vacation began. At 6 p.m. we boarded the Stella Australis, a small Chilean cruise ship (small at least on the scale of cruise ships), along with around 200 others. We had a really big cabin, with a huge window to see everything around os on this 5 day trip. Sometimes, me and my brother would sit at the small table in front of the window and just watch the world passing by, while drinking mate. But as the schedule on the ship was full of excursions (or, as they called it - probably for marketing reasons - expeditions), presentations and eating, we didn't end up in front of the window that often. Already in Ushuaia we had been talking about how long it stayed bright outside, in contrast to at home, where it was winter. On my grandfather's birthday, which happens to coincide with the shortest day of the year in the northern hemisphere, the 21st of December, it was most obvious. At half past nine in the evening, it was still almost like daytime. And on this year's 24th of December, I made myself a nice little Christmas present. I got up at 4, to photograph sunrise. That was a great idea. Not only because seeing sunrise from a ship, near Cape Horn, at Christmas day, alone on deck, is a pretty special thing. Also because in the days after we never got another real sunrise, it was always too cloudy that early in the morning. Later this day, we were supposed to go on land on Cape Horn. But, due to waves at the place we would land, we couldn't. And so, we saw Cape Horn from the ship and didn't get to set foot on it, too bad. This year was only the second time in my life, I think, not celebrating Christmas with all of my family. Usually, we would meet at someone's home and have a yummy dinner together, talk, drink and just have a good time. This year, Christmas felt a bit forced to me. The crew was running around in Santa hats and they even had one of the crew members walk in dressed up as a Santa and take pictures with people at their tables. Fortunately, we escaped the room before they came to our table. I really wonder, what kind of bet the guy in the costume lost. As a Christmas present we also got to witness a beautiful rainbow over the patagonian landscape, unfortunately my camera was nowhere near and I could only snap a picture with my phone - but it turned out rather good (see it in the folder with the images which you can find in the first post). On the following day, we did an excursion to a glacier, and we got pretty near to it's white and blue face, sometimes seeing and hearing parts of it fall off and land in the water. It was similar to Perito Moreno, but with a lot fewer people around and a different feeling of course - this was not a glacier that every tourist in Patagonia sees. I absolutely loved the moody atmosphere while we were there, just before we stepped into our zodiacs to return to the ship again, it started to rain a little bit. And when we were back on the ship, leaving the glacier behind us, I saw how the rain had, just a bit further up, still been snow. So I guess we even got a white Christmas! Where the falling snow had melted and transformed into rain, it left a perfect border line of snow on the landscape. And the mountains around us were surrounded by clouds, revealing glaciated peaks and cliffs. Later that day, we would go to another glacier, where we were given the options of either staying on the ship or doing a hike on land to a waterfall. I chose to stay on the ship, as we were told that the views of the glacier would be much better from the ship than during the trip on land. My brother and father chose to go on the adventure, walking on a path that gets very few visitors, compared to the likes of Torres del Paines crowded trails. I also used the time to edit some of my images of the trip, with the beautiful views of the patagonian landscape in front of me. Next time: more glaciers, this time from even nearer, and penguins, tons of penguins! 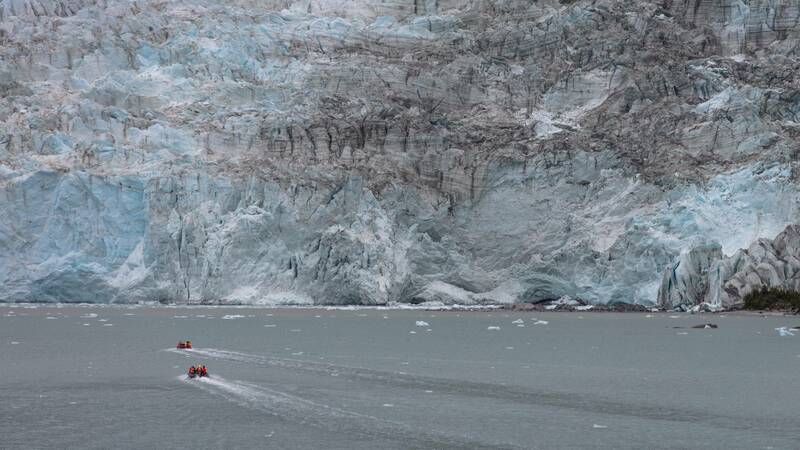 On this day, we set out to do two excursions - one where we would once again set foot on land in a national park that is rather hard to visit due to its remoteness and restrictions, and one where we would stay on the zodiacs but get very, very near to a glaciers tung. On this day, the weather was a mix of blue sky and grey clouds, very characteristic of this region, I guess. We walked for a bit, to reach yet another glacier flowing down from the mountains, overlooking a beautiful lagoon. Our guide took us into the beautiful, untouched forest and we spent some time soaking in the lush greens of the mosses, ground plants and tree leaves. What fascinated me most was the view of the mountains across the channel, towering over the sea, with the interesting shore of our side in the foreground. On the way back, my father took a fun picture of me holding a king crab shell over my face - it reminded me of an image he had taken years ago, on my first big journey, through Canada. There I held the skill and antlers of a moose to my head and I always quite liked that image. Let's see, maybe I can continue that series. When it was time to get back to the ship, they had built up a little stand where they handed out hot chocolate, if you wanted with a bit of whiskey mixed in. Obviously, I got myself one! The second excursion this day was to a glacier in a fjord that didn't really allow for going on land, but instead we got really up close with the glacier. That was really impressive as well, and the guides on our boats took images of us with the glacier front in the background. This day we woke up to know that it would be out last day on the ship. We would do one last excursion in the morning and then, around noon, arrive at Punta Arenas. So, I had promised penguins. Well, today we got to see a ton of penguins. 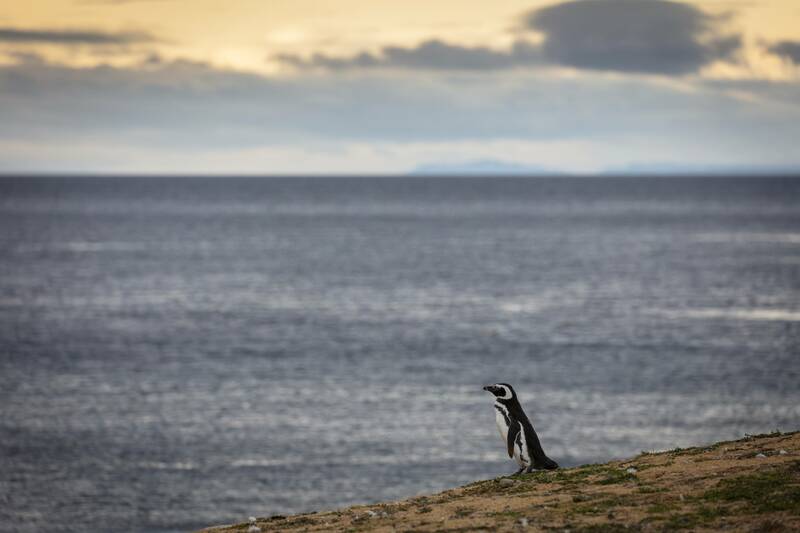 This island near Punta Arenas, which actually is a wildlife refuge and park, hosts a ton of penguins. I've forgotten the actual numbers but I believe it's around 50'000 animals. As this is a protective zone as well, you can't just walk wherever you want. There's a path around the island, which everyone has to take, and the rangers and crew members watch closely that nobody leaves the trail. However, there's really no need to leave the trail either. The penguins don't mind the humans and so sometimes they cross the trail right in front of you, or some of them breed just a meter or two away from the trail. So it's easy to get close looks and, of course, photographs too. I took a lot of images of the small fellas and a few of them you can find with all the other images of my trip, just look for the link in the first post. After we had spent about one hour on the island, we got back into our zodiacs and boarded the Stella Australis for one last time. We had a last lunch at the big, in parts vegetarian-friendly, buffet. Then it was time to clean up our room, pack our stuff and wait for the crew to allow us to leave the ship. Even though the pier was really small, they wouldn't allow passengers to walk on it and so we had to step into a bus that would drop us off again just two minutes later. Here, we separated. The rest of my family had a flight to Santiago in the afternoon, while mine would leave the local airport in the evening. Why were we not on the same plane? Well, because when the whole trip was being booked, I hadn't decided yet if I wanted to go with the others to Santiago directly or if I wanted to start my own travels at the very southernmost tip of Chile. After some thinking I had decided that it would be best to go to Santiago with them, to celebrate my birthday with them and to learn some more Spanish before embarking on my travels through South America. But when I had reached this conclusion, there were no seats left on the plane they would take. So I had to get the one in the evening. However, this turned out to be just fine like this. This way I had time to meet the brother of a neighbor from back in Switzerland and give him a package from his sister that we had brought to Chile. No, no drugs in it. Just some swiss stuff that you can't find in Chile! In the evening I flew to Santiago, and because he'd given me the tip to sit on the right side in the plane, I even got a quick glance at Torres del Paine! When I was in Santiago, I was living with a family that, decades ago, met my neighbours from back in Switzerland. Their daughter's husband had a very nice house near a weekend getaway place for many Santiagans, called Lago Rapel. When my family left Santiago and I stayed, it was the 31st of December and they invited me to spend new year's eve together with them at their house near the lake. I really enjoyed the time there - everything was so silent. On the first of January I woke up as relaxed as I hadn't been in months. Literally. After all the noise of the big city, it was a great relief to get away, to a more rural place. So after that, I knew I wanted to go back. And so, one weekend, we all went again together. And this time around, I brought my camera with me, mainly to photograph the birds at the lake during sunrise and sunset. I walked away with a few really good ones I think. And so I'd like to share these images with you. You can find more of them in my collection of images that opens up once you click on one of the images in the slideshow above. This day would be the one, after one month in the city I would finally leave Santiago and start traveling with everything that fit in my backpack. I got up early, in order to catch the bus to Talca, 3 hours south of Santiago. I arrived at the bus station about 15 minutes early and so the bus wasn't there, which had me worried at first, if I was at the right bus station - Santiago has many of them and some are near enough that one could end up at the wrong one. But five minutes later, the bus arrived and I got in, handing my backpack to the staff, who in return, handed me a piece of paper with a number on it. On arrival at Talca I would have to show that to get my backpack. This way they make sure stuff doesn't get stolen. After a 3 hours bus ride in the second floor and at the very front - I made sure to get a good view of the journey - we arrived at Talca. Here, one of the staff pointed out to me, where the bus to Altas Vilches would leave. Altas Vilches is the entry point to Altas del Lircay National Reserve, where I wanted to go. The bus would take another 2 hours, cost 3 CHF and be without the number for your baggage - that was "self-service" at the back of the (much smaller) bus. Luckily, nobody seemed to be interested in a ~25kg blue backpack and so I arrived at the final stop, only a few meters short of the park entrance. There they would check my campstove, because apparently there had been problems with malfunctioning ones in the past. From there it was another 2km to the rangers office, where I had to pay the entry fee and tell them where I was headed. My plan was to do the Condor Circuit, which takes anywhere between 6-8 days. The ranger tells me that I won't be alone on the trail, as there were many others doing it at the moment. This relieved me a bit because I hadn't been on such a long backcountry trip where there's zero cellphone coverage and no houses or roads nearby. After that, I made my way to the first camping. This one I had to pay as it was inside the park and included facilities like showers and toilets. On the way I felt my hips hurt from the heavy backpack and I hoped that that would go away in the coming days. When I arrived I was pretty tired, no wonder after one month of doing nothing in Santiago. After I set up my tent - which proved to be more difficult than I thought because it was new and I'd never set it up before - I ate some snacks and decided to go to a viewpoint for seeing and photographing sunset. It took me about an hour and a half to get up the 500 meters, and I could still feel hauling the backpack to the first camp in my bones. But when I arrived I was stunned - what a view! I could see the valley which I would hike through the next day and behind it the majestic Vólcan Descabezado (=beheaded), just short of 4000m. I brought out my camera and started photographing - there wasn't much time left before sunset. But clouds started to move in and soon they blocked most of the light from the scene. I felt a bit sad, because I had hoped for some colors around sunset and had only gotten a few not so strong golden hour images. However, when I had almost given up hope, because the clouds were pretty thick, sun burst through and illuminated the whole landscape in the most fantastic light. Needless to say that I couldn't believe my luck and thanked my earlier me who forced me up the mountain instead of the tired body. The second day I started rather relaxed. I had thought about getting up for sunrise as well, but then decided not to. I didn't want to start into my adventure with a lack of sleep. When I got out of my tent at around 9 I think there still wasn't a lot going on on the campsite. So I searched for my cereals and added some water. I had pimped the mix of oats from the supermarket with dried bananas and slices of coconut that I had bought on the market in Santiago for a few pesos. While I was waiting for the oats to soak in, I got some more water and enjoyed the warm morning sun on my face. While I was eating my breakfast I talked to two Chileans that had come to camp and hike in the park for the weekend. They were from Santiago - as so many others that I had met before. No wonder, I was still pretty near to the capital and also it was school break. The two were very kind and offered me a tea. I hadn't brought any tea to minimize gas consumption. I also didn't have a cup - weight savings - but a pot works just fine as well. Then I packed all my stuff into my big blue backpack and left the campsite at around 11 o'clock - off to the next campsite. First, I had to get down into the valley, about 800 m of height difference. With a heavy backpack, downwards can be quite challenging. But it turned out to be less exhausting than I had expected. I'm sure the shade of the forest helped a lot as well. Down in the valley I decide to take a little detour to a waterfall marked on the map. I ended up having to cross the river, for which I left behind my backpack and just brought the camera. It was well worth it - the waterfall was really pretty! I got back to my backpack and continued hiking though the valley. The sun had intensified and was burning on my skin, having me fear I'd get burned. The river crossing I did with my shoes on - it wasn't deep and the layer of sand and dust worked like the a world class impregnation - they didn't even appear wet on the other side of the river. At that time, I met some others, who told me that it was another 2 to 2.5 hours to the campsite. I thought okay, that's not too bad. But soon I felt how I was getting tired. And the final 150 m in elevation gain were really hard. I arrived at the campsite totally exhausted and thirsty. After a bit of relaxing I soon pitch my tent under a tree and start talking to two others who arrived a bit after me. They are from Talca and here to climb Descabezado. It turns out that the man also is into photography and so he guides me to a waterfall nearby of which I wouldn't have known if it wasn't for him. Actually there are two waterfalls, both of the same river that has carved its way through hardened lava. After that, we return to the campsite and I cook myself some dinner - risotto with tomatoes. This day I get up early, to photograph sunrise. The day before I had seen a few locations where I could imagine taking a good photo in the morning. But it turns out that none of the mountains around get any good morning light, probably because it is blocked by Descabezado. It was still beautiful seeing some of the morning light and wandering around in the fresh, clear air. Then, on my way back to the campsite I see a fox. He stares at me while I slow down, stop and out down my backpack to slowly and carefully get my camera out. But of course, the moment I reach for my camera, he turns around and disappears into the bushes. Even though I didn't get any images, this really made for an uplifting morning. After a cold but tasty breakfast of oats, coconut shreds and dried banana chips, I take a shower before leaving. It was cold (the shower), but that was actually a good thing at the beginning of a day that, temperature-wise, felt like being inside a toaster. At the beginning, I progress pretty fast, but then come the elevation gains promised by the map and I get slower, having to take breaks every now and then. What gets me through this is listening to some good podcasts about the internet (Reply all), crime culture in distinct American cities (Crimetown), technology (Plusplus) and science (Science vs). I guess it works a bit like talking to people while hiking - it distracts you from the seemingly never-ending uphill stretches. After about 700 m uphill, I lay down exhausted in the shade to eat my sparse lunch: two energy bars (the worst part is that they're so tasty that you want to eat all you have after having just one) and some trail mix (also this is dangerous, because it's so tasty). It sounds like very little, but it worked, it gave me the energy needed and when I had put together my food I had felt like I couldn't carry more than this. Afterwards, I climb down into a valley where, according to my map, should've been a lake. But there was absolutely nothing. Fortunately, locals had warned me the day before and so this didn't take me by surprise. Apparently, this lake dried out when the devastating earthquake and tsunami hit Chile back in 2010. However, had I relied on this water source, I wouldn't have died. The Rio Blanquillo, that carved this valley, is still there. And it's gorgeous, with views of Cerro Azul and Volcán Descabezado in the background and it's lines of washed along pumice stone. After crossing it, the path proceeds into a strange landscape that almost seems a bit moonlike. Hills of small, light grey stones, complemented by black boulders around me, in the background the massive Vólcan Descabezado and Cerro Azul. Now, the campsite isn't far and arrive a few minutes later, completely exhausted. The sun had been burning on my skin all day long and I was desperate for some shadow to protect my skin, but also to cool down a little bit. The only shade I found was a big boulder in the middle of the campground that threw a tiny bit of shade. I squeezed myself into it and didn't get up for one hour, I just sat there and watched others arrive, all from the same direction as me. Then, I set up my tent, which was harder than expected due to the hard, stony ground. When I finished I had regained enough energy to grab my backpack with the camera inside and head back a few minutes on the trail to photograph sunset. But unfortunately, there wasn't much to be had - the landscape was fascinating but there was no good light that evening. So I get back to my tent and cook some dinner - couscous with some veggies. I had set my alarm for sunrise, but when I looked out my tent, I could see nothing but grey clouds. But I got out into the cold nevertheless, you never know what nature prepared for you. But just like the day before, it didn't work out. I didn't capture one single image this morning, there was simply no light that worked with the surrounding landscape. When I got back to my camp I mounted my tele lens and began to photograph the various birds that were present in this green oasis in the midst of volcanic desert. I had observed them the day before and had thought I would spend some time photographing them later. So I got a chance to do that. There are a few small ones that are being fed by their parents, a real eye-catcher. Two others at the camp ask me if I wanted to join them to go see a few nearby lakes. But I decide I'd rather have a relaxed day, regarding the days to come. Some people had told me that these were the most exhausting ones and I also had to sew my pants before they would rip into two parts. So I continued photographing the birds and eventually a condor flew by pretty near and I even spotted a fox - and this time I had my camera ready. Later, I got back into my very dusty tent - the wind had been blowing strong and the fine stuff got everywhere. I hoped that I would get rid of it again at some point, everything was coated in a fine layer of brown dust and I didn't think it would do a lot of good to my equipment - tent, sleeping pad, camera, filters... I fell asleep shortly thereafter and when I woke back up it was afternoon and everyone had left camp. So I decided that it was time to wash myself - I got my (dusty) towel and walked down to the thermal spring that was literally 5 meters away from my tent. The water was cristal clear and so I sat down in the nice and warm (but not hot) water. It's a dream. You're a three day's hike away from civilization but there you're sitting in this wonderfully clear water, with a great view of a nearly 4000m volcano in front of you. I just thought to myself how great that instagram hasn't found out about this place yet. But then I remembered the three day's hike and the lack of WiFi - they're never gonna find out. With wrinkly hands and toes I got out of the water again and back into my tent. How nice to be clean again - or a bit less dusty at least. This evening I took off again to photograph sunset. And this time it worked out, I had searched out a composition in the morning and it worked pretty well I think. I didn't get the perfect red evening light though. That seemed to be blocked by something and as I looked up and noticed the strong wind, I realized why. From the direction I was heading in the next day, I saw a cloud of dust and sand - it almost looked like a sandstorm approaching. So I packed up my camera and went back to my tent, where I spent the remaining few hours hoping that I wouldn't have to go against that sort of weather tomorrow. This morning I again went to photograph sunrise. But it didn't work out because there was so much dust in the air and so I went back to my tent, packed up everything and ate breakfast. I lifted up my 26-or-so kg backpack and started walking. I felt good, relaxed and with my energy reserves filled up again after a day of relaxing. The landscape changed again, I left the green oasis and walked towards a valley of pumice stone sprinkled with heavy black and grey blocks. I was progressing well and the path was mostly pretty good and well visible. There was only one short stretch where it disappeared, and remembering the stormy weather of the past evening and this morning's lack of light, I knew why. These light pumice stones not only float in water, they are also easily blown away by stronger winds. Something I would get to feel first-hand shortly thereafter. As the wind picked up I felt the tiniest of the stones hitting the naked skin of my legs, arms and face - it felt like needles poking my skin. I turned my face towards the ground to protect it from the impact of the stones, with the result that they landed in my hair - I would wash out the last ones of them about three days later. A bit later, it began to hail. But just for a short bit and not very heavily, so I didn't even bother putting on my jacket. I just looked at the little particles of ice bumping off of the grey boulders amidst the whitish pumice. I reached a valley with a beautiful river and slowly climbed up the valley side, where the trail would at times get more unstable, making progress a bit harder. But I finally arrived to a beautiful plain with a river delta in it, that nourished some wonderfully colorful yellow, orange and red wildflowers along it's streams. This river as well, carried pumice in it, which created some beautiful lines, you can see some images of this in the link to all images of my trip at the very top of this page. I put down my backpack and wander around barefoot, coming by a few places I pick out to photograph at later in the evening - at the moment it's only about three o'clock. I find a big boulder next to the river and build up my tent between the two. This way I would be sheltered from winds coming from one side at least. After that, I pack all my photography stuff into my backpack and wander back to the places I had picked out before. I spend a few hours photographing the wonderful landscape in which I am completely alone, no others are anywhere near. I get some great images of the river with its lines of pumice and the colorful mountains in the background. But clouds move in and block the last rays of light, so I wander back to the tent. But on the way there, the clouds start glowing in a beautiful pink and so I stop to pull out my camera and tripod once again. I get some final images, then I hear the sound of few but big raindrops on my jacket. I get back to my tent a bit faster than I would've without hearing that sound and start preparing my dinner - cheese risotto. I put on my rain jacket as well, as the rain is increasing. Then I flinch, the flash of lightning had just lit up the sky. I love the mountains, but I hate thunderstorms, for obvious reasons. Nervously I finish cooking my risotto and crawl into my tent as quickly as I can. I try to enjoy my risotto with little success, the increasing frequency of light flashes and thunder make me nervous. On one hand I'm in a valley surrounded by mountains, on the other hand I'm next to a big boulder and the river, while the top of my tent is made of metal. I lay down on my sleeping pad and try to sleep - what should I do? Either, nature decides to fry me, in which case it doesn't matter if I'm sleeping or worriedly sitting in my tent. Needless to say I wouldn't have been fried in my sleep - you (at least I) can't sleep when there's a thunderstorm rumbling around you. I think the nearest the lightning came was about 600m, measured using the method of measuring the time difference between light and thunder. Luckily, the thunderstorm stops about two hours later and I fall asleep. I wake up to my alarm and realize that I slept like a stone, I feel super relaxed and ready to get out of my warm sleeping bag to photograph sunrise. This night I had slept at 2400m, and coming out of my tent I feel how much colder it is up here as compared to the last few nights I spent at around 1100-1800m. But I'm not sure if that's really just the altitude, probably it's also connected to the thunderstorm of last night. There is not one cloud in the sky and so I walk uphill on the trail, towards a small lake that I had seen on the map the day before. All of a sudden, while I'm walking up the sandy trail, the surroundings are lit up by a flash. It's so unexpected I actually flinch and immediately I think "oh no, more lightning! How can that be???" But as I turn around and search for a sign of a thunderstorm on the sky I realize that I'm the opposite of unfortunate. What had lit up the sky was a very intense shooting star! In fact I could still see it, and after it disappeared there was even a streak of smoke viaible in the sky - emitted by the shooting star. Never before had I seen something like this. I had once seen this in a timelapse movie by a photographer from Switzerland and he'd said that apparently these are really rare to come by. I grinned, what a great start into the day! About ten minutes later I arrived at the small lake and a little later, the first rays of sun touch the mountains around me - one of them having otherworldly bands of different colors. After the most beautiful colors of sunrise had happened, I hiked back to my tent and started breaking it down. As I was doing that I saw a weather front slowly moving towards me. I wasn't sure if it would actually bring bad weather, it didn't look very dangerous. Still, after the lightning storm last night I was a bit skeptical and I considered shortcutting my hike by taking another route from here, getting closer to civilization earlier. But after I checked the weather forecast via my InReach I was positive that this was harmless and started walking further on the trail. That turned out to be just the right decision. Even though I wasted some energy by walking up the hill side where there was no real path, realizing that I had to go all the way back down once I had reached the top, I still really enjoyed the walk through the rolling hills and valleys of sand and pumice, especially as I got another great view on the colorful mountains standing tall over the valley I had camped at. After I had climbed about 300m up to the pass, I walked down about 700m to the next camp. When I came closer to the campsite marked on the map, I smelled it first: rotten eggs. When I arrived I saw where that was coming from: fumes blowing out of the side of the mountain, yellow and brown crusts, blubbering grey mud. Hot springs! Another chance to take a bath, which I did after dinner, just as sun was setting. And this time, the water was hot, in fact the water coming out of the mountain was so hot you actually had to cut off the water inlet and wait for quite some time for the water to cool down to a temperature that wouldn't burn your skin. Who needs Iceland when you've got Chile!? On this campsite I wasn't the only one. There were a few Chileans that seemed to have come with horses, but then there was also a group of about 10 or 15 that were from the army. At home, I don't think twice about people from the army riding the same train or driving around in cars and buses. But in other countries it's always a bit different. In addition, the Chilean army doesn't have the most uplifting past and a friend in Santiago didn't seem to be too thrilled about them either, even nowadays. I knew why they were there, they were searching for someone that had gone missing on the trail a few weeks ago. So when one of them came over and talked to me I already knew some things, but I got some more details. They had been searching for over two weeks now, and the person had disappeared almost three weeks ago now I think. So the chances of finding him alive were close to zero I guessed. Nevertheless, they kept searching. Apparently they were a group of three, hiking the same trail as I was, in the same direction. When they left this camp they had some disagreement about where the trail went, nearer to the river flowing in the valley, or more uphill. One of them took the lower trail, and was never seen again. Day 7 - Is that a cloud? This morning, I didn't get up to photograph sunrise, simply because there wouldn't be a lot to see from this deep valley. Nevertheless I got going early, because I knew this would be a hot day, where I wanted to arrive at my destination as early as possible. The trail would take me along the side of the mountain that sun would burn down on all day long, with literally no chance for walking in the shade as there was no tall vegetation in this volcanic landscape. So I started even before the rescue team of the army had begun another day of searching for what by now most probably would only be a body. The trail starts out going down hill for a bit, which makes it an easy beginning. After a few minutes I wonder how long this trail would continue going down hill and looked on the map on my phone, only to realize that I had taken the wrong path. So I turned around and found the right trail, now going uphill towards my goal for the day. The trail is well visible and pretty easy, there isn't a strong incline and so I progress quite rapidly. While walking on the slightly exposed hillside I look around and suddenly see a big cloud in the north and instantly hope that it'll nice over to me, so I'd get some shade today. But as I climb higher, I realize that this is a weird cloud and one that I probably actually don't want to move in my direction. It is coming right out the top of a pyramidal mountain - this is a cloud of volcanic ash! The volcano is far away and I'm not worried at all. Rather, I'm fascinated by what I'm seeing - this hike is proving to be more than worth it. I leave behind the fascinating sight and continue on my trail along the side of the mountain, steadily progressing while listening to more podcasts. When I get near the pass that marks the highest point I'll go today I sit down in the shade of a big boulder in the landscape, pull off my shoes and eat my lunch. Then, I get up again to climb the last 150m, arriving at the pass shortly thereafter. I walk down the valley towards the lake I'll be camping at tonight. On my way I encounter a few cows grazing in another green oasis created by a river flowing out of the side of the mountain. Unfortunately, I also encounter a bunch of trash on the ground near the trail. A sign that I'm getting closer to civilization again. Then I see it: the wonderfully dark blue lake that is called Laguna La Ánima - which would translate into lake of the soul or something like that - surrounded by a beautiful sandy beach. I pitch my tent near the small creek, so I wouldn't have to walk far for water, and also because I was told by two that were just leaving that there was less wind on that side of the lake. All of a sudden I see a hawk flying by not too far a way. I get my camera and take some photographs, but he's still quite far away. So I walk up the creek towards a little waterfall to fill up my water bottle. It turns out to be absolutely wonderful. There are vivid red, orange and yellow flowers growing on its sides. As I'm walking down towards my tent again, I realize that the hawk has returned. And it's extremely near this time. I walk more slowly, so as not to disturb him and make him fly away. I get in and out of my tent, grabbing my camera in the process, without him leaving. I am super excited - he's very near. I walk around him to get the sun in my back, so that he's evenly lit for taking photographs. I spend quite a while photographing the beautiful bird, getting nearer and nearer, until I am only about five meters away. He doesn't seem to mind me too much, as he just keeps sitting there staring at the surroundings and me. After a while I decide that I have more than enough pictures and so I leave him and go back to my tent. I pack my camera gear and head for the waterfall again, to photograph it in the warm light of the late afternoon. Then, I observe and photograph a beautiful sunset at the lagoon, before I head back to my tent and eat dinner. As I crawled into my sleeping bag I felt and heard the wind picking up. I didn't really sleep that night, the strong wind kept me awake. So my alarm for sunrise didn't really wake me up, it just told me that the other day I had thought that maybe the wind would die off during the night. It didn't, so there was a lot of dust in the air and I didn't bother to get out of my tent that early. But a bit later I got up to go to the lake to photograph the Blanquillos (ducks) I had seen the evening before. They were really quite fascinating, with their red eyes, diving for food about every 10 to 15 seconds, and sometimes approaching quite near. Together with the soft early morning light it made for some really nice images. Then, I went back to my tent and treated myself to a warm breakfast, which I had avoided during the trip in order to save gas. But at this point it was clear that I had more than enough gas. That day I also had a rather short hike, 600m down to a campsite called El Bolsón, run by the park rangers. After only about 2 hours of hiking I arrived and immediately searched for a bit of shade to relax in, as it was really hot that day. In the afternoon I managed to get up and walk to a nearby waterfall that has created a pool where you could bath in. That's obviously what I did, allowing my body to cool down a bit - and to get a bit cleaner as well of course. I went there again for sunset, to take pictures of the beautiful waterfall and the mountain in the background. Then, I went back to my tent and ate dinner on a rather crowded campground - at least compared to the ones I had been on the last few days. This morning, my tent was pretty wet - for the first time on this hike. That was a bit unfortunate because I wasn't planning on pitching it again that evening, as this was my last day hiking. I had planned to go to the next village and find a comfy bed in a hostel or hotel. But I couldn't wait for it to dry either, because I still had a few hours to hike and get to where the bus departed. This day was descent only and it was actually more exhausting than I had expected. When I arrived at Parque Inglés, which marked the end point of the hike, I found a restaurant and treated myself to a nice meal of salad, fries, tomato, avocado and carrots (this might not sound like a great lunch, but believe me, after 8 days of purely eating trail mix and energy bars for lunch, this is great). I caught a bus to a nearby park called 7 Tazas for it's formation of waterfalls and pools that lign up like pearls on a string. However, when I got there, there were so many people trying to snap a selfie with the formation in the background that I just shook my head and turned around - I did not feel like waiting in line just to take a photo of that thing. So I just talked to one of the park rangers and waited for the next bus to come. It arrived a few hours later. I got in, sat down and watched the landscape pass by through the window. As we drove away from the mountains, clouds started to appear and when we arrived in the town of Molina, it was a grey evening. I went searching for a hostel with single rooms or a hotel and ended up renting a room in a rather fancy boutique hotel, but it was worth it - after 8 nights in my tent, I enjoyed a big, comfy bed, a private shower and a window to the world through the internet a lot. In total, the version of the circuit I did (you could short cut it or even extend it a bit), was 91km. Including the side trips for photography I probably hiked something like 100km though. Not bad!